Glass working model with visible valves, fitted on wooden stand, complete with water reservoir. Made of all glass, with visible colored valves. Overall height approx. 350mm; working model mounted on wooden stand; with plastic trough. Approx. overall height x weight (400x150mm). Made of corning glass. With hard-earned experience of our adept professionals, we manufacture and supply a precisely manufactured Force Pump. 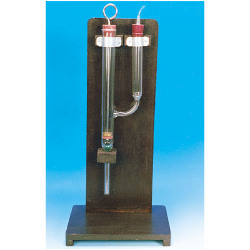 We offer high quality glass working model with visible valves, fitted on wooden stand, complete with water reservoir.